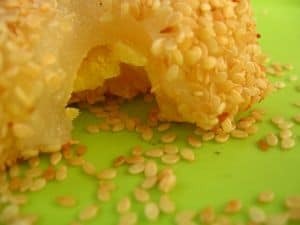 Sesame seeds are found in recipes from all over the world. You’ll find them used in Mexican moles, Middle Eastern desserts, Asian dishes and topping American hamburger buns. It’s no wonder considering how tasty and healthy they are. Here are some good reasons to get more sesame seeds into your diet and a tasty Korean BBQ recipe that will help you sneak them past the most finicky eaters. Check out this page and this page for more detailed information. Almost any kind of meat (or tofu) will do in this recipe. My favorites are beef short ribs, chicken thighs, tri tip, pork loin and firm tofu. Make the marinade as much as a week in advance and marinade the meet for at least and hour and as long as 24 hours. The most important part of this recipe is the toasted and then crushed sesame seeds. Don’t skip that part! Toast sesame seeds in a dry skillet over medium heat until they turn a light brown and are fragrant. Put them in a blender or food processor and pulse until mostly crushed. Smell that flavor!!! 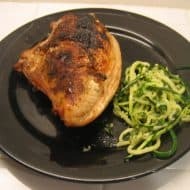 Combine the rest of the ingredients and either keep in the fridge until ready to use or pour on your meat to marinade. Wait as long as you can stand it and then fire up the grill and cook over high heat to get a good char. Cook until finished and serve with kimchi and rice or whatever else your family likes. Leftovers are possibly even better! …but the ingredients don’t make much sense (green bag, red bag, etc…) until you go to the Chinese market. You’ll definitely not find these ingredients in any other place.